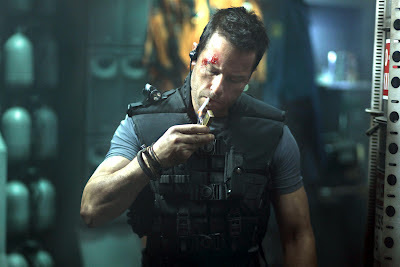 Synopsis: Ex-CIA agent Snow (Pearce) is falsely accused of murder and sentenced to 30 years in MS One - a maximum penitentiary facility in space. It just so happens that the President's daughter, Emilie (Grace), is on a humanitarian mission to the prison around the same time when a prison break occurs and she's held hostage. As a compromise, Snow is sent to MS One to save the President's daughter while also holding his own reasons for wanting to go. Andrew: Mark this day down, readers, because today is a first. Today is the day Sarah and I completely disagree on a movie and we get the opportunity to play "point-counterpoint" and I'm REALLY looking forward to this. 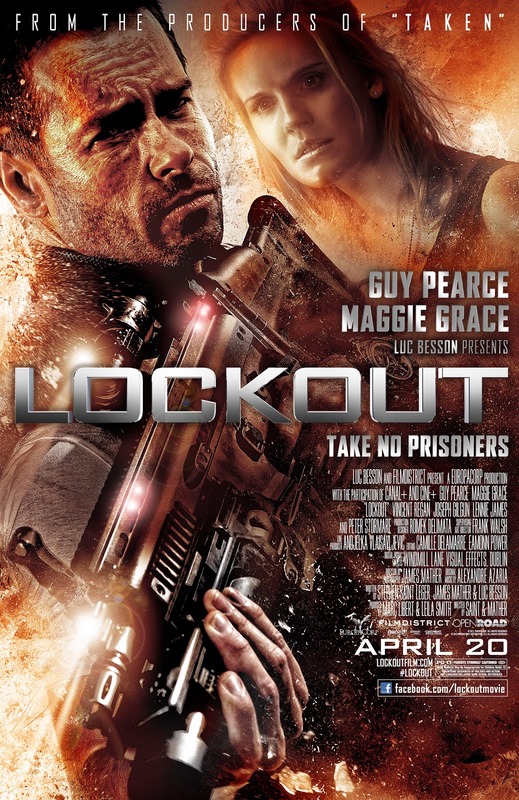 Last night we saw the new sci-fi action flick Lockout starring Guy Pearce (Memento) and Maggie Grace (Taken). From the first time I saw the trailer for this film and it made me laugh I have been looking forward to seeing this one, and I have to say: I THOROUGHLY enjoyed it. Sarah: Was not impressed AT ALL. Everything from the storyline to the action screamed cheesy and ridiculous. From the very first action sequence I was like, "What the..." I was just not impressed. There is a chase scene in the first sequence that really was like something straight out of a video game with Pearce poorly overlaid on the computer animation. A: Of all the things I could possibly concede to you in this review, the special effects in that opening sequence are the one thing I will give you. They're terrible, look like they were made with a video game, and they shouldn't have been allowed in a film that isn't direct-to-DVD. That said, the rest of the special effects in the movie are actually pretty damn good. It's pretty obvious that almost all the CGI budget went towards the outer-space scenes and not that first sequence, because the space scenes were on par with Star Wars or Star Trek most of the time. S: And I will give you that - the rest were pretty sweet even if the action left some to be desired. The storyline also left a lot to be desired. There seemed to be three different storylines going at one time and they all seemed to compete. There is Snow (Pearce) and this secret mission that is somehow connected to the CIA and Secret Service. The there is Emilie (Grace) who is going to this space prison to check out and see if tests are being performed on the inmates for deep-space travel research, THEN there is the whole all the bad guys wake up and the ship falls out of the sky thing. And NONE of these lines seem to come together in any sort of discernible logic. A: To that I'll say I felt the three storylines actually did thread well together when all was said and done. To say why would risk spoiling the end game of the movie, which I was impressed with because my expectations FOR the plot weren't very high. It's pretty obvious this is a "guy movie" and unapolegetically so. It has explosions, it has gunfire, it has the damsel in distress, it's about a PRISON IN OUTER-SPACE, and it has Guy Pearce playing a guy who could be a future descendent of Bruce Willis' John McClane. It's pretty clear that's what they're going for - right down to both characters having a particular fear (McClane = flying/Snow = heights), smoking (they even make a point of it to say nobody smokes in the future except Snow), and the pithy one-liners (which cracked me up). 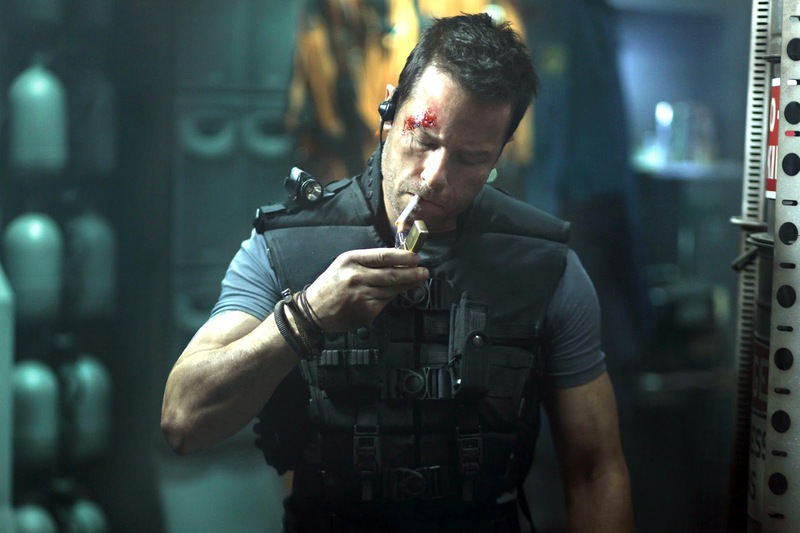 Andrew’s Note: Guy Pearce probably saved this movie with his comedic timing and delivery. He was perfectly cast for it and I’m glad to see him in something like this. The back-and-forth between him and Grace was maybe my favorite thing about the movie. S: NO, see HERE'S where I draw the line. A "guy" movie? I think that is crap. You and I have seen many *quote, unquote* guy movie that I have actually really enjoyed. 21 JUMP STREET could have been considered a "guy" movie but no, I really liked it and so did many other women who I know that saw it. So to give the chauvinistic line "oh it's just a guy movie" to summarize why this movie is crap is just an excuse. The one-liners and weak story were annoying. The THREE different times when the heroes are hiding and the bad guys walk right past them, then turn around and NO ONE is there was ridiculous. The fact that when the President sends in the air strike and NONE of the pilots are like "hey maybe we should take out the guns on the station instead of just trying to weave around them" is a joke. This movie could have been good, really good in fact if they had just stuck with ONE storyline. They leave a little at the end, I believe in the hopes that this first one would make enough to entice a sequel, and it just leaves you kinda going, "That's it?" A: I'm not saying that this is a great movie, by any stretch of the imagination. 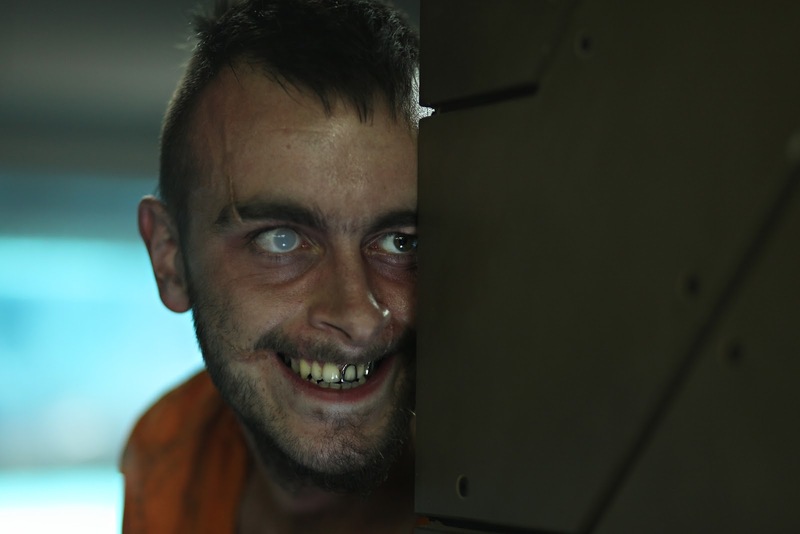 Is it possible that I'm letting those things you just pointed out slide a bit because it's a Luc Besson produced movie about a prison in space? Sure. 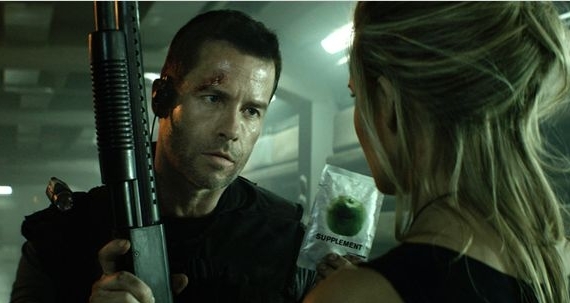 But what I'm trying to say is that if some of our readers like a cheesy action flick that can essentially be boiled down to "it's Die Hard in space," then they'll like this movie like I did. If they don't, then this isn't the movie for them. S: Correction, a SUPER cheesy movie in space. And while I know you didn't think this is a great movie, the fact that you enjoyed it is enough to make me gag a little. So, readers, I think that it's safe to say that this isn't a movie that you should drop what you're doing and head to the theatres to see. It's probably not one that you ever really need to see, but we have finally given you a review where we really did not see eye-to-eye on this one, and probably never will. So happy movie viewing because there are some fun ones coming out over the next couple of weeks that we are excited to see! A: I WILL be seeing The Cabin in the Woods tomorrow while the wife works, so look out for that review soon! Solid review Andrew. Of course you get what you would expect from a B-grade sci-fi flick but it's still a lot of fun and the cast knows how to sell this type of material, as ridiculous as it may be. Guy Pearce also has a blast with this role and it's so great to see that from such a professional like him.